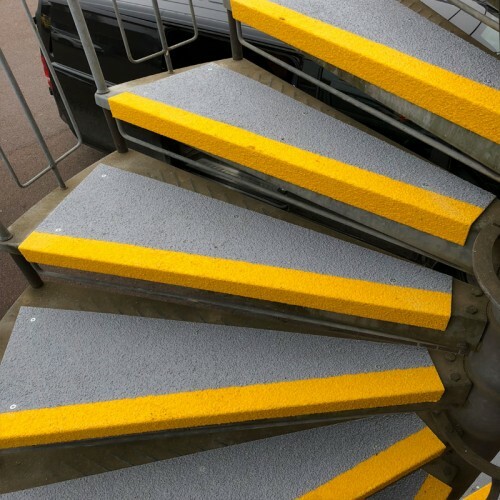 High performance anti slip step covers made from high quality GRP (Glass Reinforced Plastic), a combination of resins and reinforcing fibres. The product is used for a many different applications. A free of charge cutting service is available to a tolerance of 3mm. Longer and shorter sizes available as well as different widths. 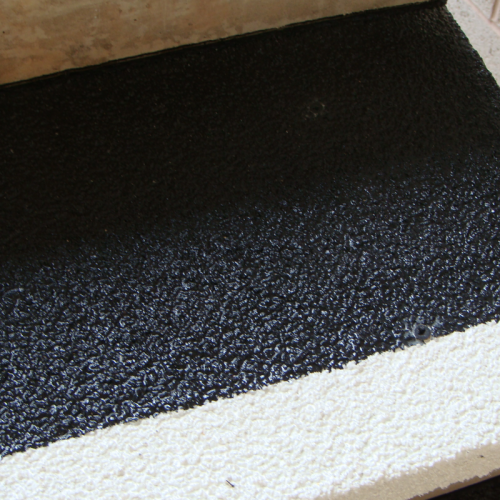 The highlighted nosing is 55 x 55mm to meet the Disabled Discrimination Act (DDA) requirements. Surfaces should be clean and dry if the FixMaster Adhesive Mastic is to be the only means of fixing. Badly dished or holed concrete etc. should ideally be filled. FixMaster Adhesive Mastic will prepare minor imperfections. 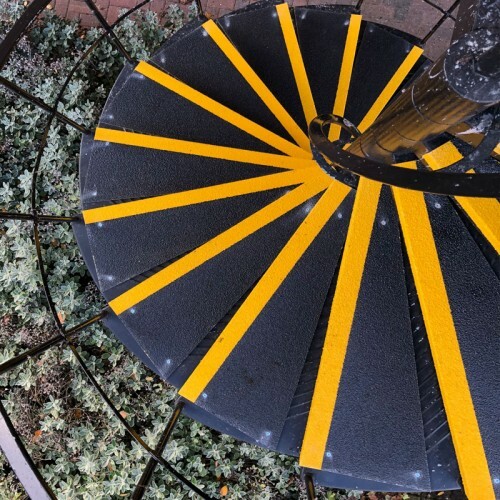 If application is too damp, dirty or friable surfaces or in very cold weather, use FixMaster Adhesive Mastic to bed the GRP item into place and then always screw fix. Screw fixings are generally made at about 600mm intervals. Drilling through the GRP is easy using a standard twist drill suitable for wood or metal. Countersinking is not required. If you need to cut the GRP product, a good quality abrasive disc, jigsaw or hacksaw can be used. The GRP material is quite tough to cut by hand, so if power tools are not readily available, please ask about our cut to size service. To timber: No.8 x 30mm zinc plated or stainless steel screws. To steel plate: No.8 x 20mm self-tapping pan head Pozi stainless steel screws or No.8 x 20mm self drilling pan head Philips zinc plated screws. To concrete: No.8 x 30mm zinc plated or stainless steel impact anchors (Hilti HPS-1 or similar). 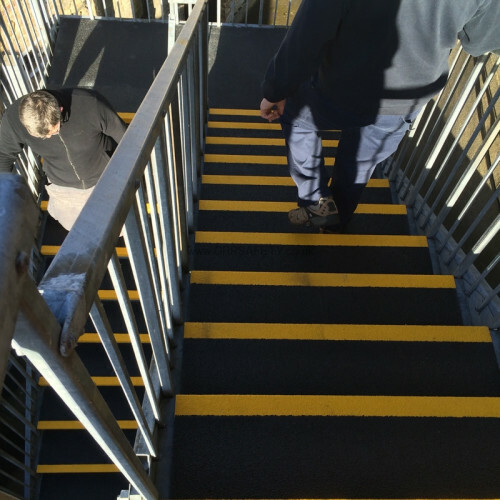 To open mesh: Stainless steel or zinc plated saddle clips and domed head bolts suitable in length for the depth of the existing treads. Lay the items in place to ensure that they fit. Trim using a jigsaw with medium cutting blades (Bosch TI01 AIF or similar are ideal). 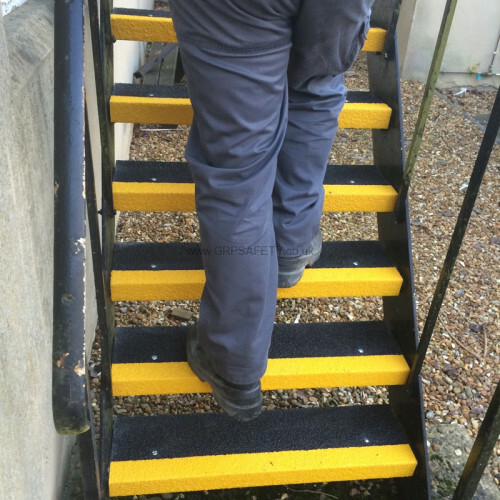 Hold the GRP in place and drill two holes at each end of the Eli-Safe Step Cover, one approximately 15mm in from the back edge and 15mm in from the side. 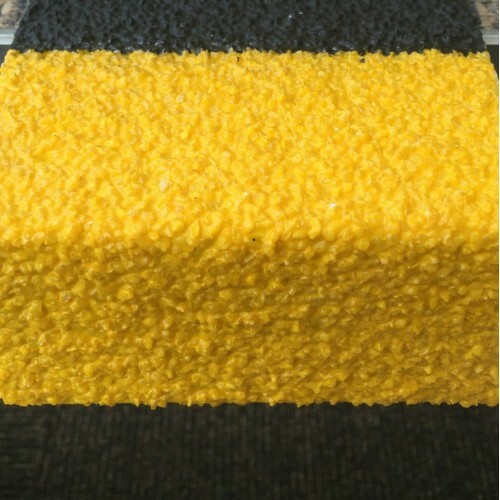 The second hole should be approximately 15mm in from the side and on the line where the black tread meets the yellow or white nosing. It is unlikely that the Step Covers will require additional fixings in the middle of the tread, (unless the tread is over 2000mm long). A rawl plug will probably be required in a concrete base. The drill hole in the GRP does not need to be larger than that drilled into the substrate. 4mm thick heavy duty, anti slip GRP flat sheets with a resin bonded anti slip surface, they are..
Photoluminescent non slip GRP step cover for added safety in the dark, with DDA compliant ..